Sharpen & Blur Effects in AKVIS Refocus 6.0 — Now with Batch Processing! AKVIS is glad to announce the release of AKVIS Refocus 6.0 for Windows and Mac OS X. The new version offers a timesaving batch processing feature, a modernized user interface with support for Ultra HD displays, advanced print options, and other improvements. AKVIS Refocus improves sharpness of out-of-focus images and adds blur effects to photos. It can process the entire image or only selected parts. Even if a photo looks sharp enough, there is always room for improvement. The program lets creating the illusion of a miniature scene or add depth to certain image areas. The software runs in 3 modes: Refocus, Tilt-Shift, and Iris Blur. Each mode includes a number of ready to use presets. Version 6.0 offers an advanced user interface with support for Ultra HD resolution displays, a timesaving batch processing feature, new print options, and other general improvements. Sharpen all the images at one go! The Batch Processing feature allows processing any number of out-of-focus images at the same time. Just select a preset and apply it to a folder full of images - the program will do the rest automatically! The new version brings support for Ultra HD 4K and 5K resolution. The interface has been redesigned and provides better display capabilities. The texts and new vector based icons now scale correctly. It's now possible to print high resolution images on multiple pages to get professional-quality posters. 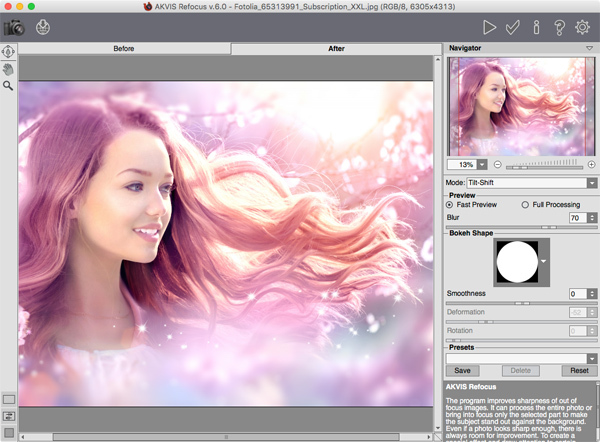 Download AKVIS Refocus 6.0 and test the software for free during 10 days! The software runs on Windows XP, Vista, 7, 8, 8.1, 10 and on Mac OS X 10.6-10.11. 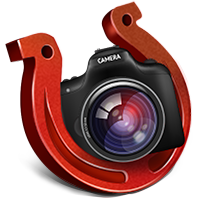 The product is available as a standalone application and as a plugin filter for Adobe Photoshop and other image editors. AKVIS Refocus, Home license, sells for $39 or €29. Refer to the official website for exact details of license types, versions, prices, etc. It is a free upgrade for recent buyers of AKVIS Refocus who bought or upgraded the license during the last 12 months. Users whose license is not valid for the new version, can get Refocus 6.0 for only $14.95. AKVIS (http://akvis.com) specializes in development of image and video processing software. The company was founded in 2004 by IT professionals having considerable experience in programming and software development. Since then the company has released a number of successful programs for Windows and Mac.